Have you heard of Pokémon GO? It’s the hottest app out there! Pokémon are creatures that come in all shapes and sizes. The premise of Pokémon GO is that “Pokémon” have been discovered on earth and with the help of an app on your phone– you are hunting them. You join a one of the three teams (red, blue and yellow) and fight for the “ownership” of gyms with your captured Pokémon helping you out. 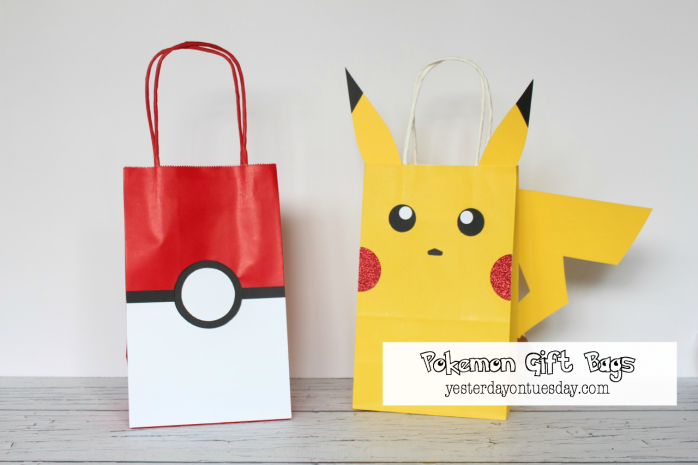 Here are some fun Pokémon Party ideas that would be perfect for a kid’s birthday party or a Pokémon GO Hunting Party! 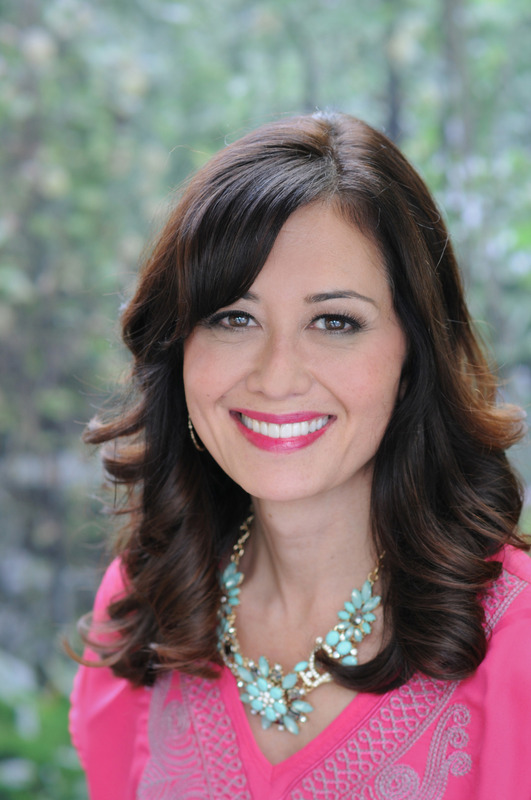 And these projects aren’t just for kids– adults seem to be as entranced with this app and the children are. 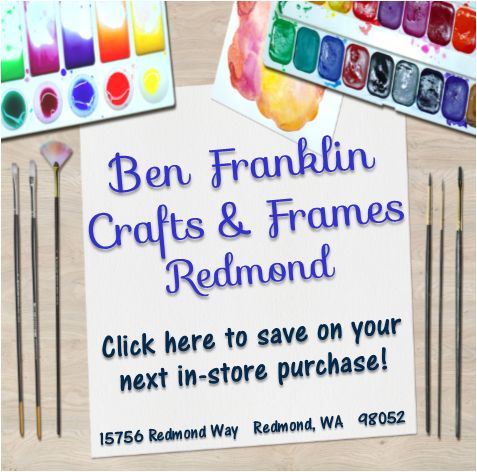 All these products are available at Ben Franklin Crafts and Frames in Redmond. 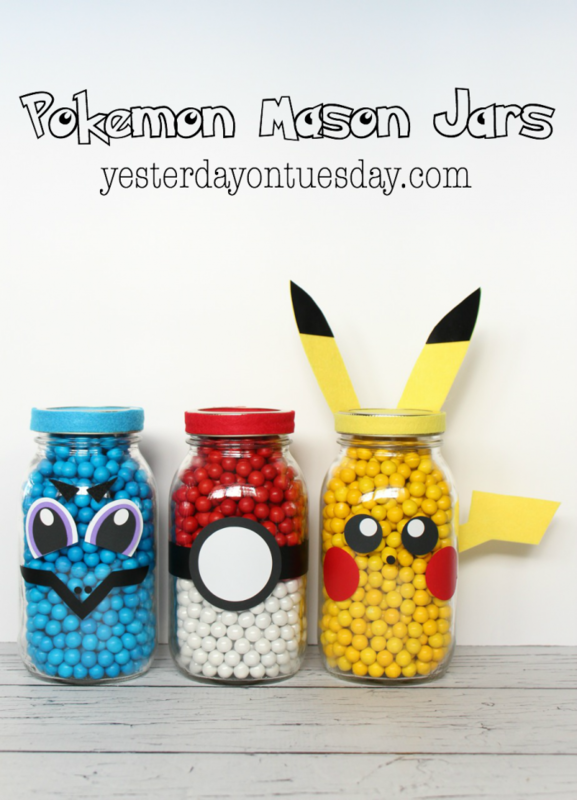 Pokéball Jar Supplies: Ball® Canning Smooth Jar, red and white Sixlets candy, a strip of black scrapbook paper or black vinyl, white scrapbook paper or vinyl, red felt, glue dots, doubled sided tape and scissors. 1. Add white Sixlets to the jar, then top with red red Sixlets. 2. Cut a strip of vinyl or black scrapbook paper to trimmed to 1 1/2″ by 12″ long. 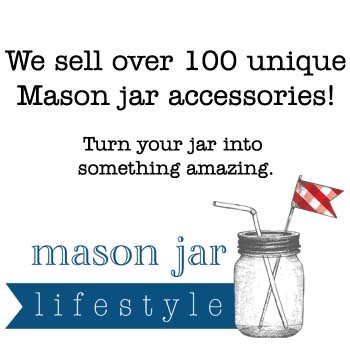 Add to middle of jar. 3. Use the bottom of drinking glasses to trace a larger black and a smaller white circle on the scrapbook paper. Use the tape to stick them together. Place on top of the black strip. 4. Use the mason jar lid to trace a circle on the felt and cut out. 5. Cut a strip of the red felt 1″ wide by 12″ long. 6. Glue felt pieces to kid and trim if necessary. Squirtle Jar Supplies: Ball® Canning Smooth Jar, white, purple and black scrapbook paper, black vinyl, the inside of small white letter “O’s,” turquoise blue felt, glue dots, doubled sided tape and scissors. 1. 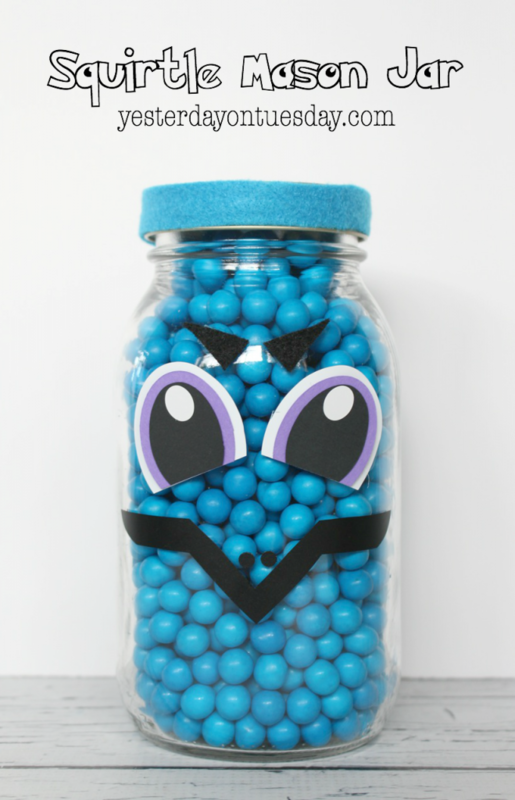 Add blue Sixlets to the jar. 2. Using the photo as a guide, cut white, purple and black ovals, stack them and glue them together. Then trim off the bottom to create the eye shape. 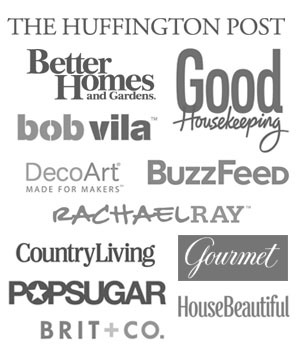 Finish with the inside of small white letter “O’s. 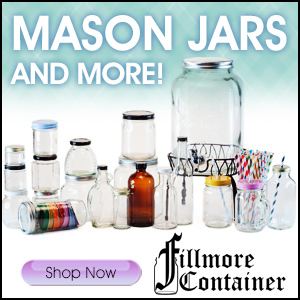 Use tape to adhere the eyes to the jar. 3. Cut two small triangles from the scrapbook paper and place above eyes. 4. Using the photo as a guide, cut a “beak” out of the black vinyl and adhere to jar. 5. Use the mason jar lid to trace a circle on the felt and cut out. 6. Cut a strip of the turquoise blue felt 1″ wide by 12″ long. 7. Glue felt pieces to lid and trim if necessary. 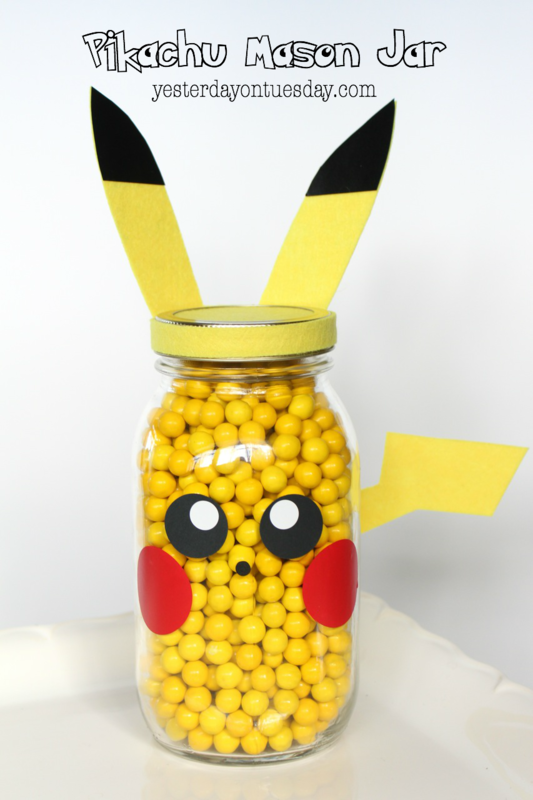 Pikachu Jar Supplies: Ball® Canning Smooth Jar, yellow Sixlet candy, yellow felt, black and white scrapbook paper, red vinyl or scrapbook paper. 1. Add yellow Sixlets to jar. 2. Cut two circles from black scrapbook paper and two smaller circles from scrapbook paper, use doubled sided tape to adhere to jar. 3. Cut two circles from the red vinyl for checks and add to jar. 4. Using the photo as a guide, cut “lightening” shape for tail, two ears and a strip of the yellow felt 1″ wide by 12″ long. 5. Trace the ears onto the black vinyl and cut out. Supplies: Loom Bands, Plastic Crochet Hook and beads. Instructions (Pick a team color and beads to match). Use the photo as a guide. For the yellow bracelet, you’ll need three yellow beads and yellow loom bands. For the red bracelet, red loom bands and beads. And for the Pokéball bracelet, white, black and red loom bands. Here are the general directions. For the yellow, blue and red bracelets, add three beads each. 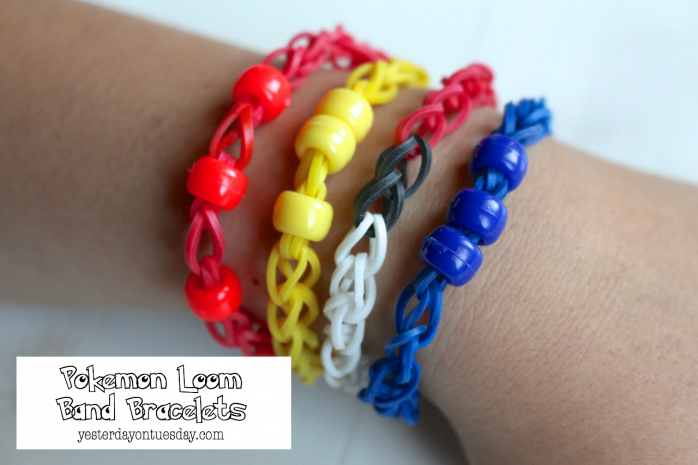 For the Pokéball bracelet, break up the white and red loom bands with a few black loom bands. 1. Place Band #1 (B1) on hook. Add Band #2 (B2). 2. Pull B2 and place B1 so it is hanging on B2. 3. Fold B2 over the hook; it will look doubled over on the hook. 4. 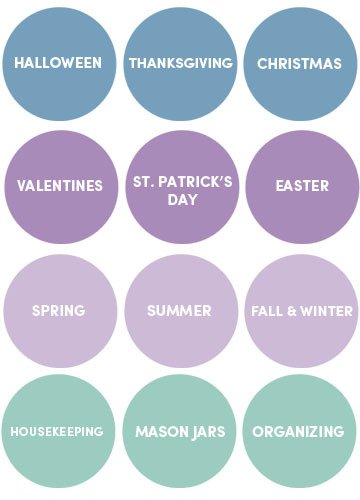 Repeat the process, adding as many bands as you want. 5. Before removing the last band, attach “C” clip, making sure it goes over both bands on the hook. Remove and place band on other end of bracelet into ring to finish. Supplies: eight to ten 20 x 30 inch sheets of tissue paper, scissors, fishing line, 24 gauge white cloth-covered floral wire or a white chenille stem. 2. Make 1 1/2 inch wide accordion folds, creasing with each fold. 3. Fold an 18 inch piece of floral wire in, twist. Trim with scissors. 6. Tie fishing like to floral wire for hanging. Supplies: red gift bag, white scrapbook paper, black scrapbook paper, circle punches, scissors and paper glue. 1. Using the photo as a guide, cut a large square or white scrapbook paper and glue it to the bag. 2. Cut a thin strip of black paper and glue it to the bag. 3. Use a circle punch to punch a black circle and a white circle and glue them to the bag. 3. Cut 2 yard pieces of tulle (or desired length doubled). 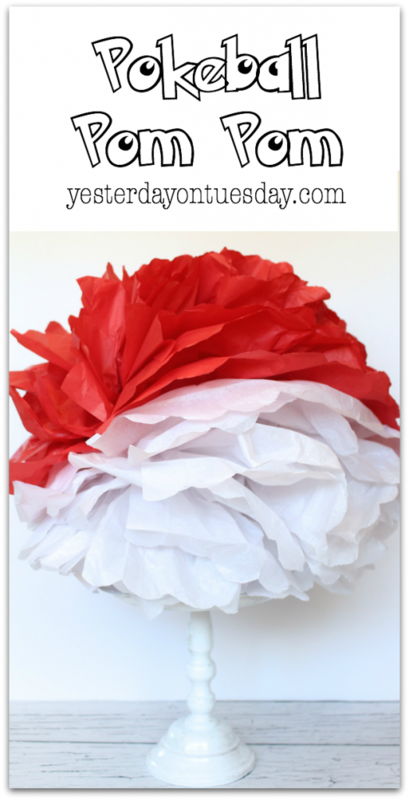 Put white tulle in back and red in front. Slip knot the middle of each piece to the waist band. Continue all around. 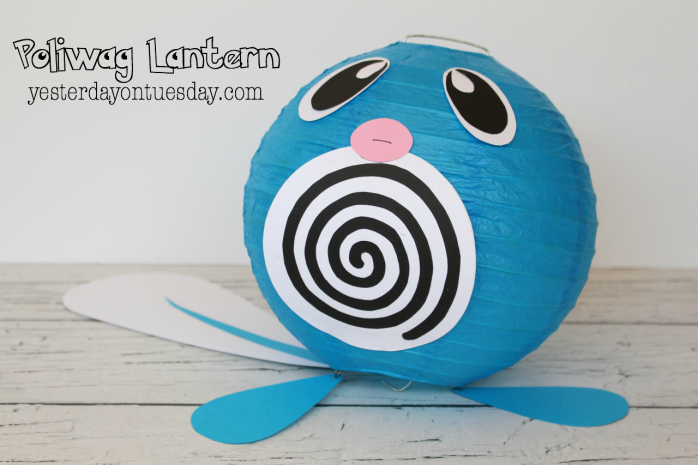 Supplies: Turquoise blue lantern, white, black, pink and turquoise scrapbook paper, jump rings a hole punch, and paper glue. 1. Using the photo as the guide cut a large circle and two large ovals for eyes from the white paper. 2. Cut black eyes and a large swirl pattern from black paper. 3. Cut two tear drop shapes for legs from the turquoise paper. 4. Cut a small pink oval for the nose. 5. Cut a large teardrop pattern from the white paper and add a strip of turquoise from the blue paper. 6. Glue pieces on lantern. 7. Add the feet with jump rings. Punch a hold in the “feet” to attach. Supplies: Foam visor, sheet of white foam, foam glue and scissors. 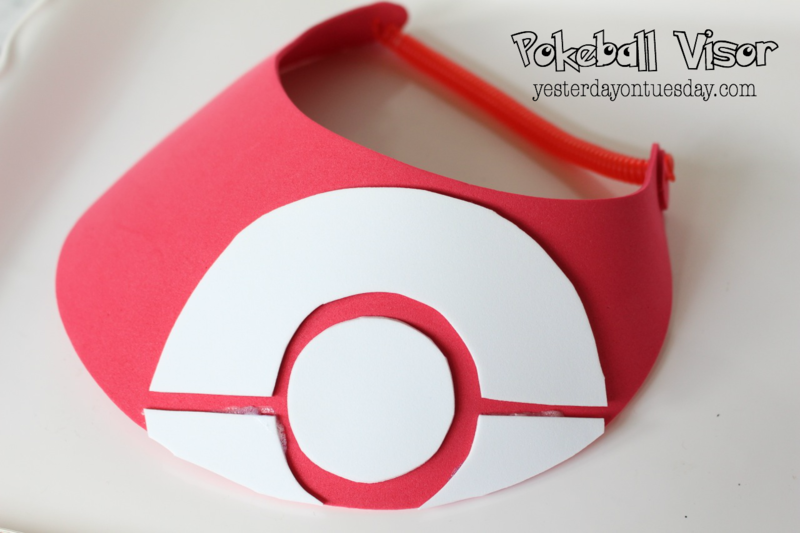 Using the photo as a guide, cut out the shape of a Pokéball from the white foam sheet. Glue onto visor. Trim the bottom edges of the Pokéball off. Malia, so many cute ideas! My boys (and I) all are playing Pokemon Go and having a blast. This would make for such a cute party. 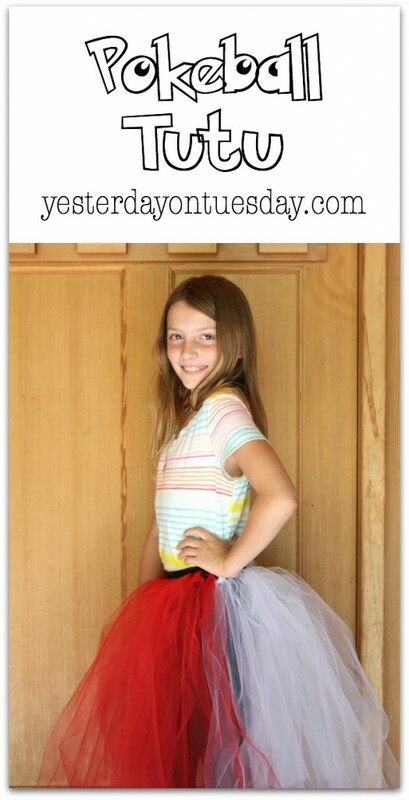 I love the tulle skirt! 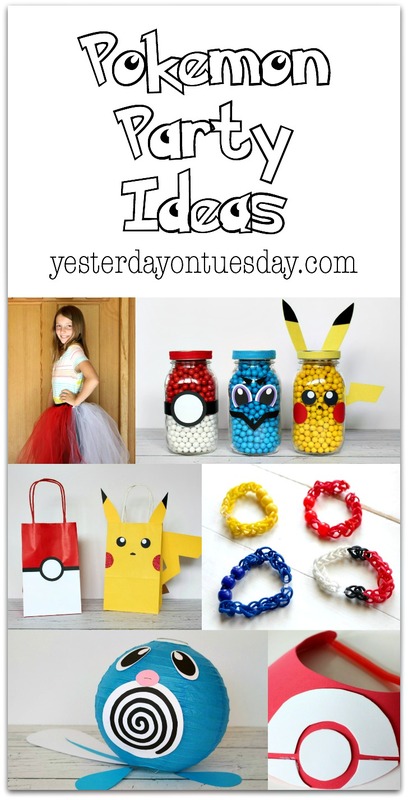 My daughter wants a Pokemon party and that skirt is the coolest way to girl-ify it. I want the make the visor, but what is foam glue? Would Elmer’s glue work just as well?